POWER Apps is a 30-Day Devotional for Youth and Young Adults. This book challenges you to download the POWER of God Daily. Update your life with POWER Apps, practical and powerful applications for the young at heart. Jeremy J. Anderson was born in Dallas, TX and spent most of his life in Huntsville, AL. He graduated from Oakwood Academy in 1999 and Oakwood University in 2004 with a Bachelor of Social Work degree. Jeremy is the oldest son of Pastor Daryl S. Anderson Sr. & Tawanna Anderson. He’s married to the former Traci Stevenson of Lexington, KY. From a young age Jeremy has demonstrated a sense of service and ministry. After graduating from Oakwood University he went on to pursue his Masters of Social Work Degree at Alabama A&M University, in Huntsville, AL. Jeremy has been blessed to work with several corporate America companies such as Enterprise, Mutual of Omaha, ITT Technical Institute, and is currently one of the Alabama Admissions Representative for WyoTech. Jeremy loves his job because he is able to travel and motivate High school students to reach their educational goals in life. 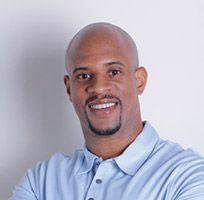 Jeremy is also the COO of Spirit Reign Communications & Publishing, the Author of "From Prodigal to Prodigy" and is currently in the Masters of Pastoral Studies Program at Oakwood University.